Winter always has me thinking about getting away or planning future trips to great destinations (preferably ones with some heat). A fantastic place to dream about to get you through these next few cold months is the south of Spain. While Spain has a mixture of diverse cultures, when I think of Spain in the traditional sense, I think of bull fights, flamenco, and eras of exploration. A great way to see where the roots of those famous elements grow deepest, spend a week (or two) in Andalucía, the southernmost region of Spain. The first stop on a trip to Andalucía is Granada. This enchanting city is full of interesting and note-worthy history, along with breathtaking architecture. Stroll through the old town, be amazed by the complex designs and beautiful gardens of the Alhambra, visit King Ferdinand and Queen Isabella in the Royal Chapel, find some street music, and cap off your stay with a sunset dinner enjoyed al fresco. Granada has something for everyone, so get ready to dig in and explore! Granada is a great starting point for an Andalucía trip, mainly due to the easy distance from the Malaga airport. Fly into the Málaga–Costa del Sol Airport (the largest in the region), and make your way to the train station right outside. 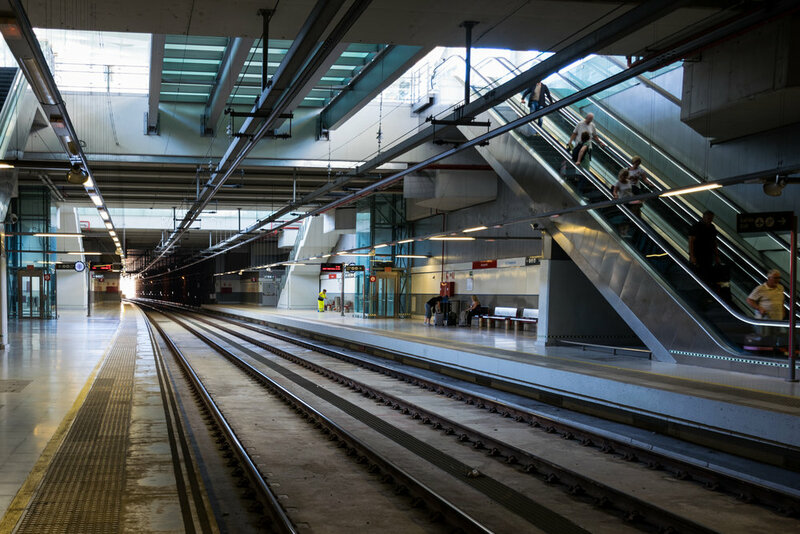 Take the train towards the city for 4 stops and get off at Málaga Maria Zambrano station. Cross the street and enter the local bus station. (There are no direct trains to Granada, so bus is the way to go) From here, catch a local bus, sit back, and get ready to enjoy the picturesque views of the Spanish countryside as you make your way to Granada. The easiest way to figure out the best bus is to ask a ticket agent, some busses make a lot of stops and some are more direct, so you could reach Granada in 1.5-2 hours... or 4. So make sure you ask. To get an idea of available times on your day of travel, plug in Malaga (ESP) to Granada (ESP) on the GetByBus website. Key travel note #1: For the rest of a trip around Andalucía, trains will be an easy and preferred mode of transport. They are fast, spacious, give you a chance to walk around, and most importantly, have bathrooms. This first leg is a little tedious, but even if you just got off an overnight flight and aren't a huge fan of busses, take this opportunity for a quick nap so you can hit the ground running when you actually arrive in Granada. Key travel note #2: If you love renting cars, you could do that... but it will be nearly impossible to park in most city centers where you want to stay, and regional trains or busses can get you almost anywhere. If you plan your trip right, you should be able to get around easily without one (and you'll probably be glad you did). If you're starting your trip in Granada, I suggest planning to stay 2 nights here to really give yourself a chance to settle in. On your first arrival day, after taking the bus from Malaga, catch a cab from the bus station to your hotel in the middle of town. Since it's always nice to ease into a first day anywhere, check-in, unpack, maybe have a shower or a cat-nap, and then head out to explore. Forget the guidebook, use this afternoon and evening to just explore the main areas between Plaza Nueva, the Cathedral, and Plaza de Bib-Rambla. Find lunch at one of the many outdoor restaurants on one main square and dinner on the other. 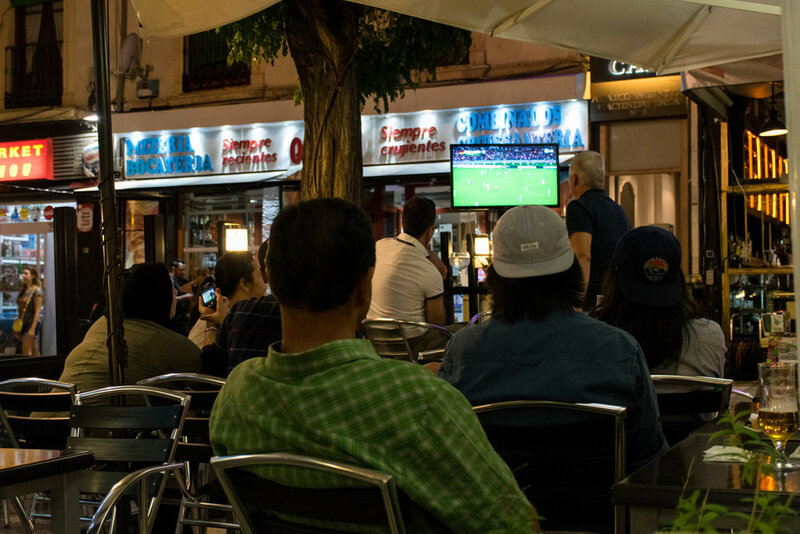 If you're lucky, maybe you'll end the night with an impromptu concert in Plaza Nueva, or if it's the right season, settle in with tourists and locals alike to watch some soccer while you have dessert to cap off your first day. The next morning will be completely focused on visiting the main attraction in Granada, The Alhambra, so make sure to have a hearty breakfast and put on your walking shoes! This is the biggest reason most people visit Granada, and wow is there a reason for it. From beautiful gardens to breathtaking Mudéjar architecture, and a renaissance palace thrown in for good measure, this immense complex will captivate any visitor for hours. 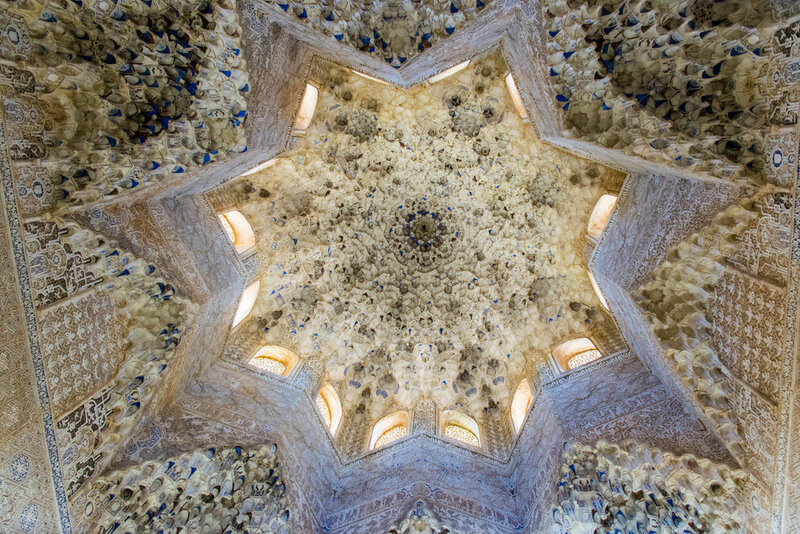 KEY NOTE: The minute you decide to visit Granada, BOOK YOUR ALHAMBRA TICKETS! Access is limited every day to keep crowd sizes down, and access to certain buildings is limited by the time period on your ticket. While the website can provide clear instructions on how to book tickets, I highly recommend getting on a guided tour to make the entire process easier and to ensure your time is well-spent. Book a tour with Cicerone - I have used this tour company and was extremely happy that I did. They start off the day by picking you up in a bus at Plaza Nueva. Upon arrival at the Alhambra, you are broken up into groups and the tour begins. By having a guide, you are able to see all of the main locations within the Alhambra, while letting them worry about keeping you on schedule. From the Moorish influence in the Palacios Nazaries to the Renaissance style in Charles V’s Palace, having a guide to make sure you don't miss an important room or view, along with understanding the historical significance of each one, is an invaluable addition to your visit. Slight caveat to this price: the website is slightly confusing and only shows night tours or "last minute" bookings, which are more expensive. Use the email address on the "Contact Us" page to make normal reservations. For reference, the regular daytime tour back in 2014 only cost 52€ so I think there might be a bit of website confusion going on. After the tour is over, you are free to continue to explore the gardens for as long as you like. My travel companions and I were pretty wiped after a full morning of walking, so we caught a bus back down to Plaza Nueva where we grabbed a quick lunch before taking a siesta. For a pre-siesta meal, stop into La Cueva. This deli / restaurant is located just a block from Plaza Nueva (where the Alhambra tour bus drop off is) and specializes in simple fare. Enjoy racks of the famous Jamón overhead with a cold cerveza. After lunch and a siesta, set back out to explore the old town. Take a stroll inside the Cathedral and marvel at the 4th largest one in the world. The grand scale and ornate finery inside are thanks to one of the most famous of all Spanish rulers, Queen Isabella. The beautiful Renaissance style cathedral is worth a visit for any architecture buff, but if you're more interested in the historical side of the "Catholic Monarchs", head next door to the Royal Chapel. It is here that you'll find the tombs of Queen Isabella & King Ferdinand, along with a large selection of everything from their crowns to parts of their own art collection. After exploring inside, get back outside with a stroll around the Plaza de Bib-Rambla. This plaza is always bustling with locals of every generation. Little children play while parents and grandparents keep watch. This is the perfect spot to grab a drink and get your fill of people watching for the day, especially since the city is thoughtful enough to provide shade screens for most of the square. On the other side of the square, follow the side streets into the Alcaicería. Mostly a tourist trap now, it is still fun to stroll amid the stalls of this once-famous market and see all of the available souvenirs in an old-world market-style setting. After a day full of walking, spend your evening relaxing over dinner with a perfect view. Start in Plaza Nueva and catch the C1 mini bus up to the Plaza de San Nicolas stop. You will see a square with an amazing view of the Alhambra, most likely already crowded with people. To the right or left of the square as you look at the view, there are stairs that lead to the street below. Take the left ones and almost directly in front of you will be the entrance to El Huerto de Juan Ranas. This is one of a few restaurants offering outdoor seating along this street, and all have a perfect view. Grab a seat, order some food and wine, and settle in for a magnificent sunset experience. Photo Tip: Plan to arrive a little bit before golden hour to set up. Then take your leisurely time as you watch the light change all the way through blue hour. Head back downhill to enjoy a late night stroll, and maybe find some live music in Plaza Nueva! During my stay in Granada, musicians would appear after dark to entertain the people out on their nightly stroll, and the locals loved to show off their dancing skills! Hotel Anacapri - This centrally located hotel is Rick Steves recommended (while staying there we even ran into one of his tour groups! ), and definitely Victinerary approved. Just steps from both the Plaza Nueva and the famous Cathedral, this hotel manages to stay quiet by being tucked into a side street. When staying here back in 2014 with two other people, we got a triple room (3 single beds). The room wasn't overly spacious but everything was neat and clean. We also opted to add a daily breakfast to our stay, and that made starting the morning so much easier. All in all, this is a great spot that I would highly recommend to Granada travelers. I hope this look into the wonders of Granada inspires you to take some time to enjoy this city during your Spanish travels. If you follow my footsteps or even just use one of the suggestions, please let me know in the comment section below about your experience! Thanks for coming along, and check back every week for a new Victinerary to help plan your next adventure!